“In my capacity as Special Rapporteur on adequate housing appointed by the UN Commission on Human Rights, I have following closely for some time the situation with respect to housing rights in Angola, particularly in light of the persisting practice of forced evictions in Luanda. I have brought my concerns to the attention of the national authorities, but no response has been received yet and the most recent events suggest that such appeals are not being taken into account. I am particularly concerned in light of the fact that my previously planned official visit to the country has been postponed and has not yet been rescheduled by the Government. 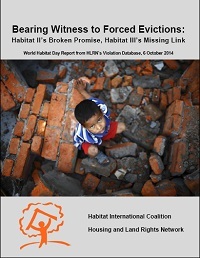 United Nations Commission on Human Rights resolutions (for example, unanimously adopted resolution 1993/77) have clearly stated that "the practice of forced eviction constitutes a gross violation of human rights". Large-scale forced evictions have been on-going in Angola for many years. Following forced evictions in areas like Boavista, Soba Kapassa and Benfica between 2001 and 2003, the vast majority of those affected did not have any alternative but to live in long-term temporary shelter or face homelessness. The pattern of lack of prior notice, inadequate or no consultation, absence of information-sharing and no possibility of participation in the decision-making process for those affected seems to have been repeated in more recent forced evictions and demolitions of homes undertaken by the Luanda Provincial Government in November and December 2005 in Cambamba I and II, Bairro 28 de Agosto and Banga Wé, in the municipality of Kilamba Kiaxi in Luanda. Over 600 families were affected by forced evictions for the purpose of implementing the governmental housing project Nova Vida. On 13 and 14 March 2006, families still remaining in the neighbourhood of Cambamba I and II were reportedly forcibly evicted by members of the National Police Force, inspectors of the provincial government, agents of a private security company (Visgo) as well as non-identified agents in civilian clothes, all acting on behalf and protecting the interests of the Nova Vida housing project. Reports indicated that members of the National Police Force, provincial inspectors as well as agents of a private security company shot into the crowd of residents, kicked and hit people with guns and whips. The law enforcement agents allegedly acted with excessive use of force and fire arms that were in no proportion to the level of resistance offered by the unarmed population. Homes were demolished and according to reports residents have not been offered alternative housing nor any type of compensation.